There are many ways to migrate to Office 365, and choosing the wrong path can turn into a disaster. In this course, Preparing to Migrate to Office 365, you will gain the ability to successfully plan a migration to Microsoft's Office 365 cloud services. 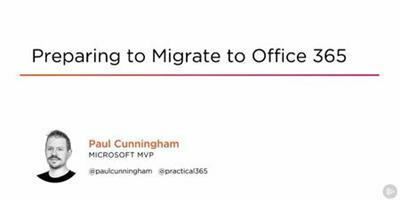 First, you will learn the foundations of a successful Office 365 migration project. Next, you will discover the different methods for migrating to Exchange Online, SharePoint Online, and Skype for Business Online or Microsoft Teams. Finally, you will explore how to get more value out of your Office 365 subscription by adopting new apps and services in the cloud. When you're finished with this course, you will have the skills and knowledge of Office 365 needed to prepare a successful migration.